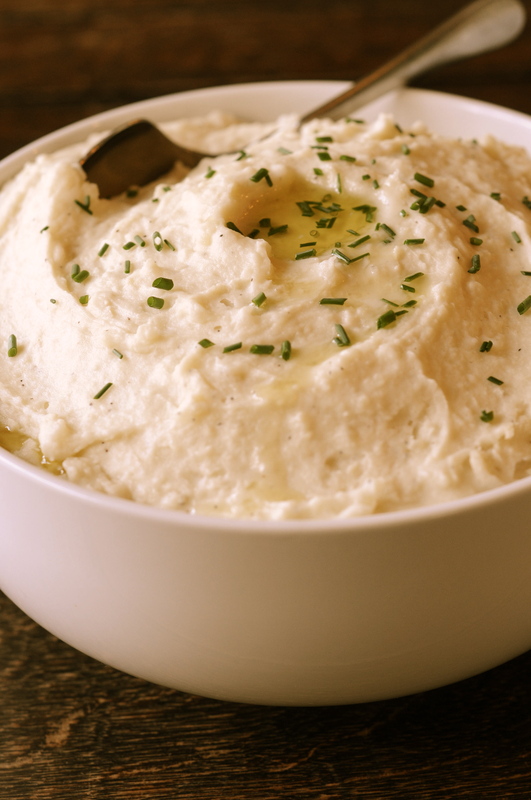 I grew up in a kosher household and assumed the rather difficult task of making mashed potatoes with no dairy products for Thanksgiving dinner. Yes, that’s right: no milk, no cheese, no delicious butter. After careful consideration, I decided to maxmize flavor by adding copious amounts of roasted garlic. Roasting garlic eliminates the sharpness, rendering the cloves sweet and tangy, perfect for adding depth to any dish. I liked the result so much I have been making them weekly ever since. 2. Drizzle garlic heads with olive oil and wrap in foil. Roast for 45 minutes. 3. While garlic is roasting, boil potatoes in salted water until tender enough to be pierced with fork. 4. When potatoes are done, drain and reserve cooking liquid. 5. When roasting time has elapsed, remove garlic from oven and let cool. 6. Place potatoes in large bowl, and squeeze cloves on top. Drizzle with several tablespoons of olive oil and sprinkle with salt and pepper. Add a cup of reserved liquid. Blend with immersion blender. Adjust consistency by adding more liquid. When potatoes are desired taste and consistency, sprinkle with chives and enjoy.